Froggy doesn’t know what he is the best at — kayaking? Surfing? T-ball? He spends a morning daydreaming about what he is the best at until finally he realizes it and goes off to do the activity he is best at! This is a treat for fans of the Froggy series. Readers will see familiar activities from many of the beloved Froggy picture books and be able to journey with a familiar friend to a new world of reading on their own. The vocabulary once again (like with Pig and Pug, another Level 2 Progressing Reader) starts off harder and gets easier as the book goes on. Readers will have unfamiliar words like “kayaking” and “surfing”, but the pictures help give context clues. 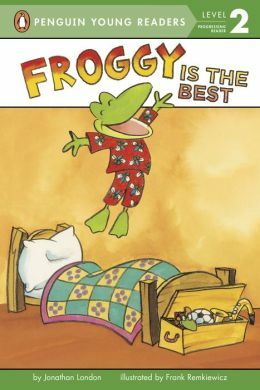 While it will never top my favorite Froggy book (Froggy Gets Dressed), I did enjoy the read. Recommended for Froggy fans everywhere!